The Trump administration is pursuing a major rollback of federal land protections—prompting a furious response. The fate of millions of acres of federal land. Last month, President Trump slashed the size of two national monuments in Utah by 2 million acres—reversing, he said, a “massive federal land grab” by former Presidents Clinton and Obama. The red rock canyon country of Bears Ears will shrink by 85 percent; Grand Staircase–Escalante, meanwhile, will be halved. These reductions came after a major lobbying campaign by the uranium industry. In addition to the Utah monuments, Interior Secretary Ryan Zinke has recommended that Trump shrink or modify another eight national monuments created since 1996—stretching from the Atlantic Ocean to California’s fir forests. These decisions have sparked a fierce battle between those who believe local residents and the free market should decide whether federal lands in a given state are developed and conservationists who believe the nation’s remaining wilderness areas belong to the American public. “The Trump administration is walking into a legal, political, and moral minefield,” says Kate Kelly, public lands director for the Center for American Progress. Unlike national parks, which can only be designated by Congress, national monuments are established with the stroke of a presidential pen. Under the century-old Antiquities Act, presidents have the authority to preserve landmarks and “other objects of historic or scientific interest” that are already under federal control, so long as they limit them to the “smallest area compatible with proper care and management.” Originally designed to protect against the looting of ancient artifacts, the act has since been used by 16 presidents, both Republican and Democratic. But conservatives say Clinton and Obama abused the act far beyond its intended purpose—creating “mega-monuments” that have locked up huge swaths of the West from traditional land uses, such as hunting and grazing. Obama protected 553 million acres during his presidency. His 29th monument, Bears Ears, was established shortly before he left office—causing an uproar in San Juan County. They argue that tourism and outdoor recreation bring more money into a community than traditional uses of the land. A study of 17 national monuments by independent nonprofit Headwaters Economics found that every local economy expanded in every single case after the monument was established. Unlike mining and fossil fuel drilling, Trump’s critics add, tourism preserves America’s natural heritage for future generations. 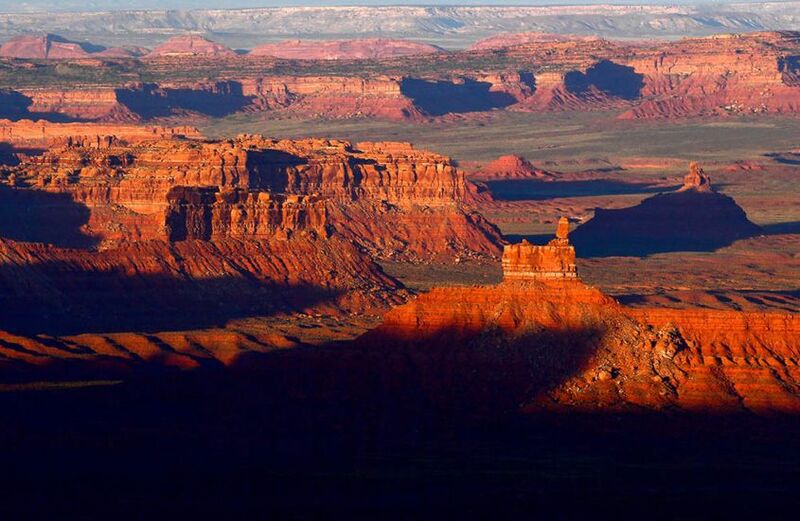 Native American activists contend that his Bears Ears decision alone threatens some 100,000 sites of archaeological importance, including gravesites and ancient cliff dwellings, while uranium mining also threatens drinking water. “It’s a historical trauma our people have been through over and over,” Helaman Thor Hale, a local Native American, told The New York Times. Will they fight the decision? A number of advocacy groups have already filed legal challenges, and if Trump targets monuments outside of Utah, the fight will expand and intensify. Rural parts of Utah, Nevada, and Idaho are currently a hotbed of “resistance” to federal control. That resistance exploded in 2014, when Nevada-based cattle rancher Cliven Bundy led an armed standoff with law enforcement over unpaid federal grazing fees, and continued two years later when his son seized the headquarters of the Malheur National Wildlife Refuge in Oregon. But Trump’s rollback faces a much chillier reception in the West’s blue states. California’s attorney general has already vowed to launch a legal challenge if Trump touches the state’s national monuments—arguing the president doesn’t have the authority to do so.